Erica Bunker | DIY Style! 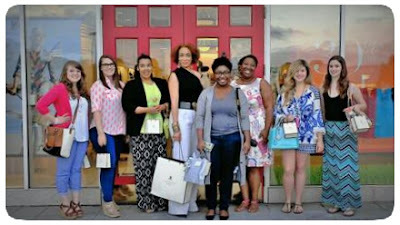 The Art of Cultivating a Stylish Wardrobe: Birmingham Blogger Event: Talbot's at The Summit! 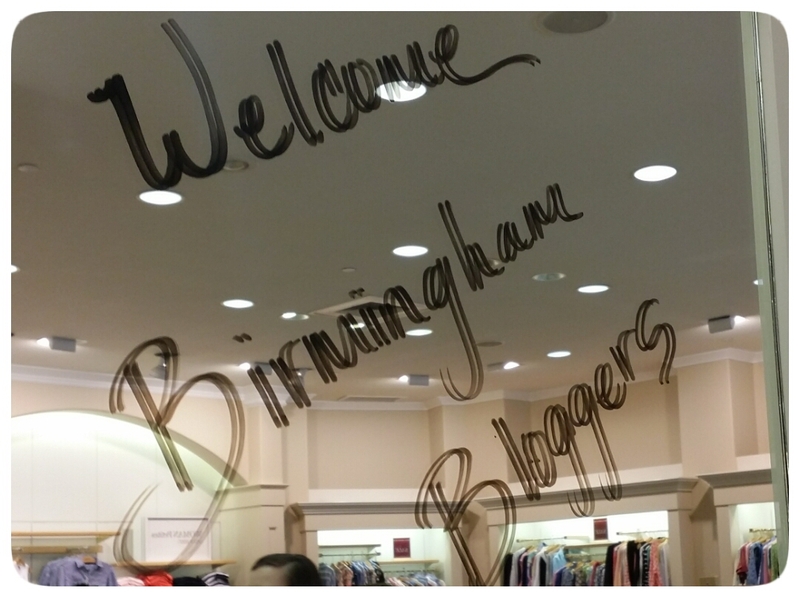 Birmingham Blogger Event: Talbot's at The Summit! Last Thursday, I attended a Birmingham Blogger event at Talbot's, hosted by the fabulous Jeniese Hosey of The Jenesaisquoi. We were invited to preview the summer collections at Talbot's and they are cute! 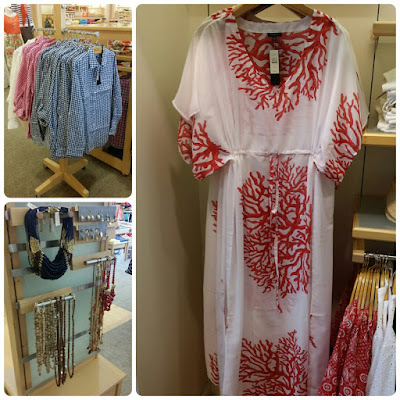 My favorite was all of the beachwear, that I wouldn't need a beach for! The caftans are fabulous and would be daywear for me! This is what I wore: top: Vogue 2540 and pants: Vogue 9032. I do love a great black and white ensemble! While I was there, they had a drawing and I was the winner of this great head-to-toe look! How amazing is that! I'm a sucker for separates and these pieces and accessories will be rotating throughout my wardrobe all summer. 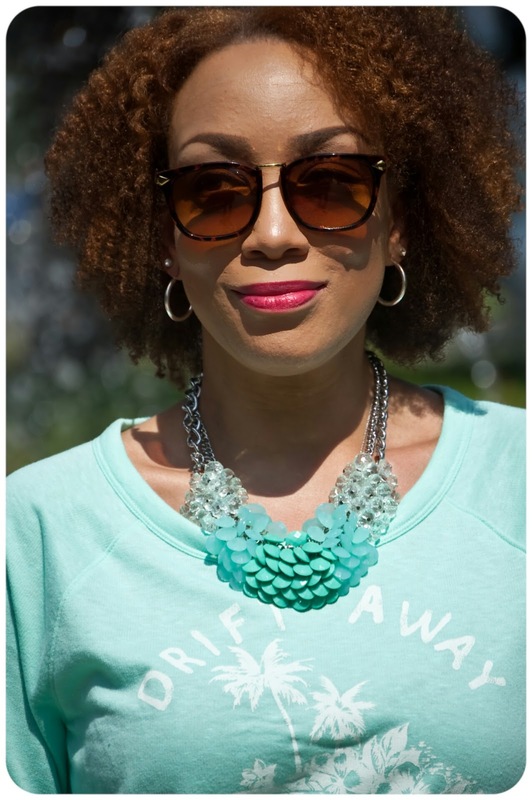 Especially this awesome bib statement necklace. I had a choice on the bag and the shoes. 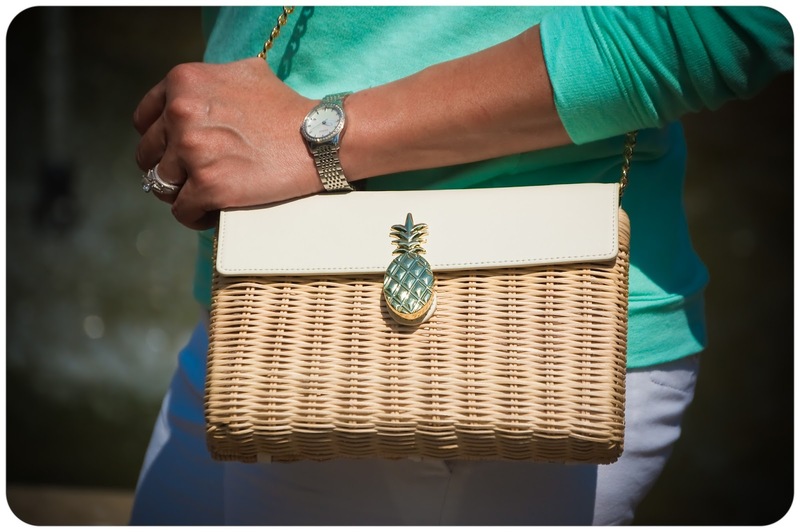 I went with the wicker clutch because I love a white bag for summer and this one can be worn with the chain strap or used as a clutch. And a great pair of flat white sandals are a must have. 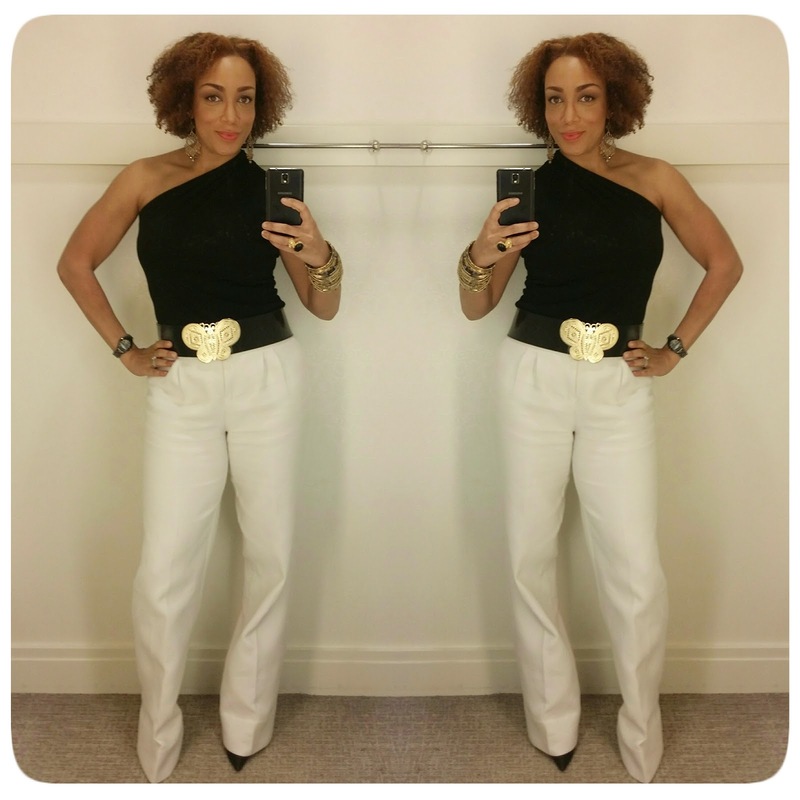 Erica, hope you don't mind me saying that the white trouser/one shoulder black top photo is the best photo I've seen of you in my opinion. The pose, the facial expression, the figure, the outfit - I like it! A lot! I have clocked major hours in the gym. Thank you! That's a major compliment! I love the black and white outfit you made. Your arms look amazing, by the way! Great definition! I love the look and you are looking fabulous, your weight loss is amazing. I'm never disappointed with any of your post. I've only been sewing for about a little over a year now and I can only pray and hope to become half of the seamstress you are. I also love your hair, what's your routine and what products do you use, if you don't mind sharing? 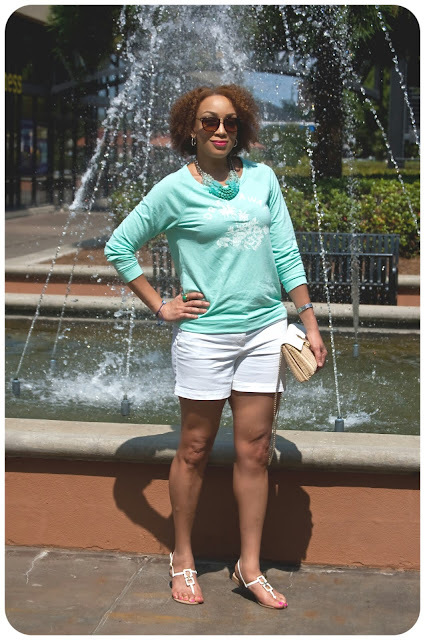 Thank you for all your hard work on your blog I'm sure all your readers feel the same as me. Fateful reader, Tempest. I go back and forth between wash and gos and twist outs... depending on the day. And the same with products... depending on my mood. Thanks!! You look fabulous in the black/white outfit - so slim and model-ish! Awww... Renata, you're so sweet! Thank you! Congrats on the win. Love the outfit. And I love what you wore to the event. GIRL.... I thought you were one of your daughters in the pictures with the shorts outfit! Your workout is paying off in in every way...looking fantastic!